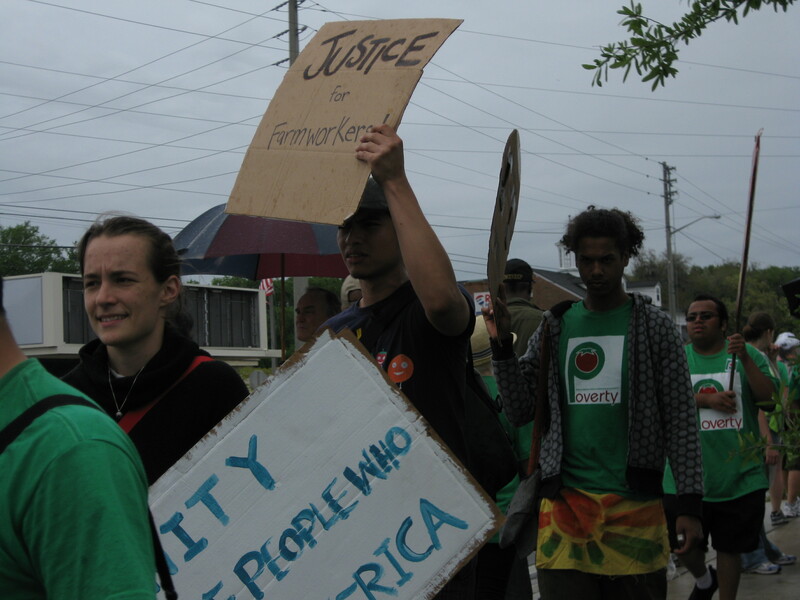 On April 18, 2010 approximately 1500 people from all over the U.S. came to participate in the Freedom Farmworker March organized by the Coalition of Immokalee Workers in Lakeland, FL. 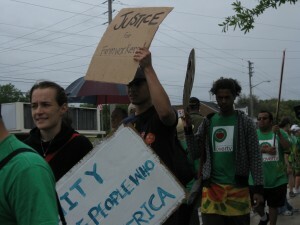 The rally in Lakeland was the third day of the march which began in Tampa, FL. The CIW and its supporters marched 22 miles altogether over a three day period of time. 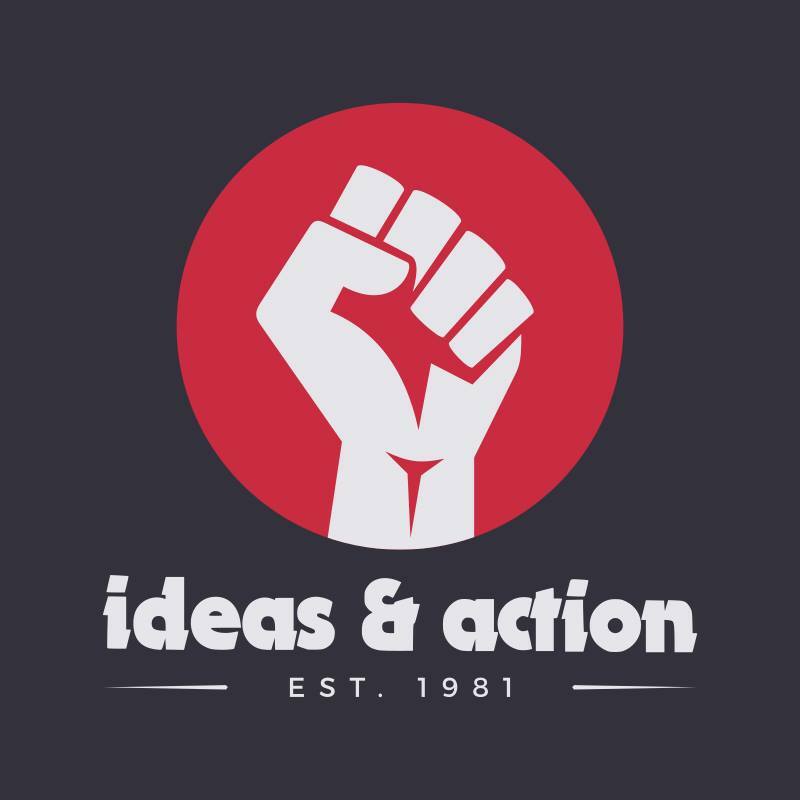 Since 2005, the WSA has been an ally organization with the CIW and has been active in the campaign against Taco Bell. To continue our support, WSA Pensacola marched in solidarity with the CIW and others on the third day of the march to make the Florida-based grocery chain, Publix, sit down with the CIW tomato pickers and negotiate to stop buying from suppliers that abuse farm workers and to pay one cent more per pound for the tomatoes picked by farm workers. Participants in the march congregated at Munn Park in downtown Lakeland as early as 11:00 A.M. to be shuttled to Publix headquarters at Southgate shopping center at 1:00 P.M. for the picket then marching over two miles after the picket back to St. Joseph’s Catholic Church for the closing rally and a concert. 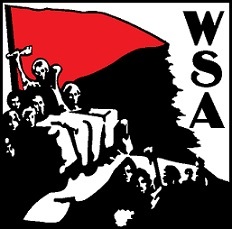 Some of the groups that came from across the U.S. and supported the CIW in their current fight against Publix were the United Workers from Balitmore, MD, the Restaurant Opportunities Center of New York, various members from U.S. branches of the Industrial Workers of the World, UNITE-HERE, the Socialist Party, Socialist Workers Party, Party for Socialism and Liberation, Students for a Democratic Society but most prominently Interfaith Action and the Student Farmworker Alliance who helped organize the event with the CIW and have played significant roles in past struggles and victories for the CIW. Despite the drizzle of rain the morale was very high from the diverse group of demonstrators supporting the CIW. Community support for the march overall was generally positive with many drivers on the blocked off roads showing support by honking their horns with very few negative responses from passersby. In fact, the only “counter” to the protest were a couple of lonely right-wingers, one of which was wearing a sombrero with Minuteman and Border Patrol hats attached to it and holding a green, yellow and red sign with anti-immigrant slogans such as “NO AMNASTY(sic)” and proclaiming support for Publx with the statement “Publix… umm, umm good!” These wingnuts were largely ignored for the most part by the energetic crowd of CIW supporters. The crowd chanted in English and Spanish, sang, and held signs such as “Publix: Where Shopping is Oppression” (a play on Publix’s corporate slogan “Where Shopping is Pleasure”). According to news sources (like the April 19, 2010 Lakeland Ledger, “Protesters Pressure Publix to Sign Deal“), Publix is denying that it purchases tomatoes from any suppliers that violate human rights. Nevertheless, the CIW will continue to push Publix to join other food retailers (such as Subway, Burger King, McDonald’s Yum Brands, Aramark and Whole Foods) the CIW has successfully formed partnerships with to support workers’ rights as part of its Fair Food Campaign since 2001. The CIW has been pushing Publix to join this campaign for over a year and if Publix does not give into the demands of the CIW after this protest, it will be interesting to see what actions the CIW and all its supporters fighting for farmworkers’ rights will take next considering that the CIW has never lost a campaign. Also of interest was the Florida Modern Slavery Museum at St. Josephs Catholic Church which chronicles how slavery occurs in modern-day Florida in the form of peonage (involuntary servitude for the purpose of fulfilling a debt) of migrant farmworkers and the horrible poverty, oppression, and abuse suffered by such workers at the hands of their bosses. For example, Supreme Court case U.S. v Naverette (2008) and also the objects such as chains which were used to imprison a group of workers inside a truck are all part of the exhibit, serving as sobering examples of how the slavery many believe we abolished in the 1870’s still exists today under our corrupt system.